IT security audit tools can centralize user identities and access for faster incident response. Automate access provisioning and deprovisioning with centralized authentication management. Monitor audit trails for better visibility and get customized reports to track any unauthorized activity. IT teams may spend too much time hunting down details during a security audit when the information they need is in multiple security-management consoles. Lack of a centralized view into these IT security policies can slow incident response and increase security threat risks. SolarWinds® Access Rights Manager (ARM) IT security audit software is built to centralize user account permissions as well as access for faster incident response and risk assessment, which can lead to easier IT security audits. In addition to demonstrating adherence to security policies, ARM helps you identify and investigate privilege abuses, suspicious account activity, and other vulnerabilities. IT audit software that does not support automated user management can consume a lot of time. Manually managing user access and permissions not only slows down IT operations, but this manual work can also increase the chances of errors that further expose your organization to potential security threats. ARM IT audit software is built to automate the user access management process. With ARM, you can quickly create, modify, activate, deactivate, and delete user access to files and services. To further protect data and streamline workloads, the web-based, self-service permissions portal gives users the ability to request access rights directly from resource owners instead of funneling all permissions requests to the administrator. IT security audits are crucial in staying ahead of insider threats and other security risks. ARM is designed to help organizations proactively take actions to help prevent data loss and breaches with role-specific templates to help ensure user provisioning and deprovisioning conforms with access-privilege delegation and security policies. Using ARM, you can easily visualize all user permissions to access files, services, and data in a tree structure with just a few clicks. 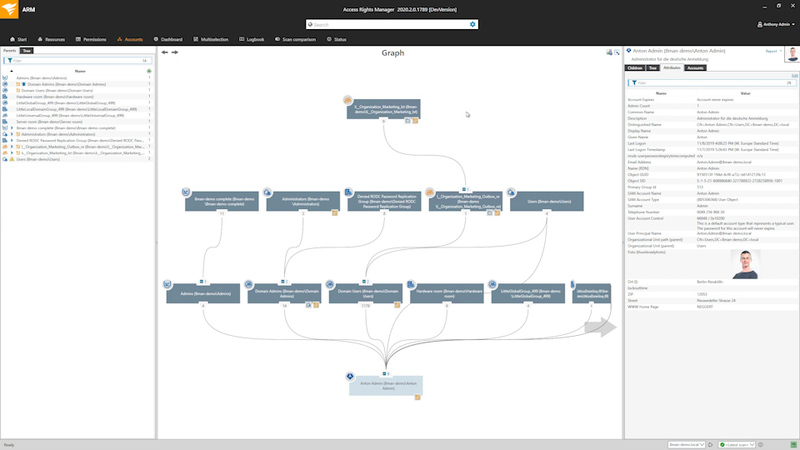 This visualization of which users have access to which resources can help in effectively monitoring privileged accounts and group memberships for Active Directory®, Exchange™, SharePoint®, and more, identifying potential security risks that could lead to unauthorized changes to sensitive files and data. ARM is built to demonstrate compliance for IT security audits and most regulatory requirements with built-in, customizable reports. ARM can also create an audit trail to support IT security audit investigations and share with compliance auditors. Quickly manage and provision user access. Generate custom management and audit reports. Traditional auditing tools for identity and access management are more prone to configuration errors and human oversights. Teams spend more time looking for issues across distributed systems, which delays response and increases security risks. Deriving insights from security logs is not easy, and IT security might be compromised if any suspicious activity is not detected. An IT security audit is the systematic process of evaluating, analyzing, and reporting about the health of an organization’s information technology infrastructure based on a predefined set of criteria to proactively identify and resolve any security vulnerabilities.